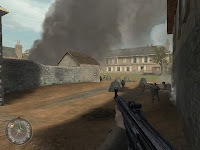 After the release of a lot of major and wonderfull campain for CODUO, Steve said he never will create anything else, so it was an excellent surprise to see a map for COD2 comming out from him. He did this just to learn a little bit more how to handle COD2 tools for it's own and finally decided to complete a short project to give to us. 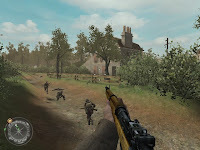 Design is really great but this isn't a surpise looking to other releases by yorkshire rifle terrain is well generated; placement of traps, houses, roads all interconnected is also quite realistic, this in a distroyed city ambiance with some external elements like plane tanks and other stuffs. But we could critic the originality, layout is great but doesn't provide anything special, it's quite close to original game features and i would have like to see a river or a train station something simply different. You progression is oriented as in a maze a make the eye looking always enjoyable. Like previous releases of Steve you have to rush into the battle if you don't want to way for years while enemies are spawning. the save points are well placed and taking back enemies weapons is something needed. Last objective is to take and hold the church, classic but immersive since there is no saving possibility. In conclusion: I didn't think Steve would ever release something for COD2, hopefully he did. Even if he didn't put so much energy and history than previous releases, It's a challenging and really enjoyable experience, full of eye candy and trilling suprises, in some word a highly recommanded experience.